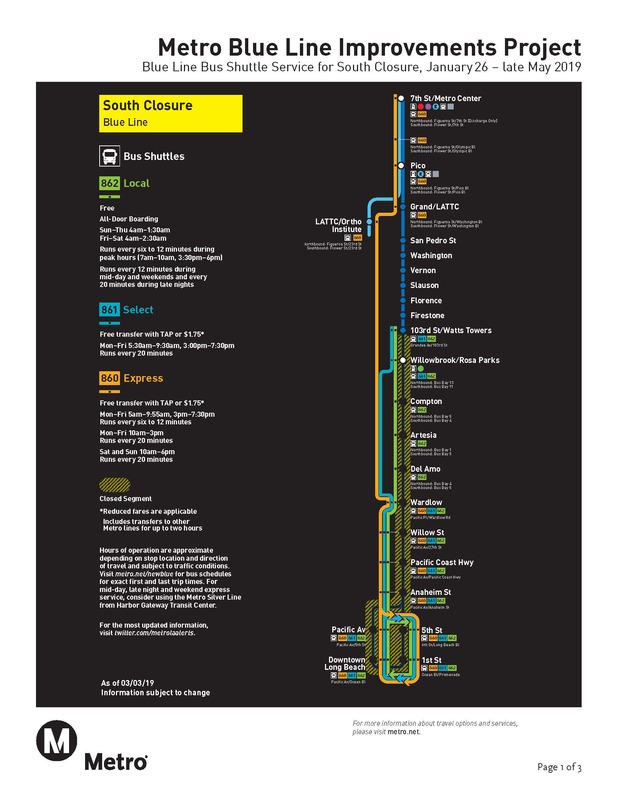 The Southern Segment of the Blue Line is scheduled to reopen on Saturday, June 1, 2019, as we move into the Northern Segment closure for four months and a shorter closure of two Expo Line stations starting on Saturday, June 22, 2019. See further details below. More information is on the way soon! We want to thank the public for their patience as we make critical improvements to the Blue Line. Please visit our Twitter handle at Metro Rider Alerts for real-time service changes. Metro is updating shuttle service as needed. Schedules are subject to change. Next stop: a better Blue Line. Major improvements are underway for Metro’s oldest light rail line. Metro began significant improvements on the Blue Line in late January 2019 and will continue through to Fall 2019. Through these improvements, Metro will invest $350 million to enhance safety, increase reliability and improve the customer experience. The Southern Segment of the Blue Line is scheduled to reopen between Downtown Long Beach and Compton Station, on Saturday, June 1, 2019. The Northern Segment of the Blue Line will be out of service between Compton Station and 7th St/Metro Center starting Saturday, June 1, 2019, through September 2019. The Blue Line Willowbrook/Rosa Parks Station will remain out of service throughout the Northern Segment closure, through September 2019. Green Line Willowbrook/Rosa Parks service will remain open. Two stations on the Expo Line will be out of service (Pico Station and 7th St/Metro Center) for 60-days starting Saturday, June 22, 2019. Metro has designed a Bus Shuttle Service Plan during these closures to provide customers with a variety of service options during the New Blue Improvements Project. Please check back soon for further information. Metro is providing three levels of bus shuttle service to replace Blue Line service during this closure. Please visit our Twitter handle at Metro Rider Alerts for real-time service changes. Metro is updating shuttle service as needed. Schedules are subject to change. Metro will replace concrete railroad crossings and temporarily close the intersections along the Blue Line on Long Beach Bl and 19th, 20th, and Hill Streets. Metro will be repairing and replacing cables underground under 8th St and Locust from 8am to 5pm daily beginning Wednesday, February 27 through Friday, March 1, 2019. 02/26/2019 East 1st Street, Broadway at Long Beach Bl and West 1st Street, Broadway at Pacific Av. Area: East 1st Street, Broadway at Long Beach Bl and West 1st Street, Broadway at Pacific Av. There will be a six-day closure of the intersections at East 1st Street, Broadway at Long Beach Bl and West 1st Street, Broadway at Pacific Av. Metro’s contractor, RailWorks, will replace concrete railroad crossings and temporarily close the intersections along the Blue Line at the multiple intersections in Long Beach. Area: Blue Line at the following locations in Long Beach: Broadway and Pacific Av, 6th St and Pacific Av, 7th St and Long Beach Bl. Metro’s contractor, RailWorks, will replace concrete railroad crossings and temporarily close the intersections along the Blue Line at the following locations in Long Beach: Broadway and Pacific Av, 6th St and Pacific Av, 7th St and Long Beach Bl. Our Service Planners have assembled this guide for additional transportation options, as the southern segment of the Metro Blue Line is under renovation. As part of work on Metro’s New Blue Improvements Project, Metro will be repairing and replacing cables underground under 8th St and Locust from 8am to 5pm daily beginning Wednesday, February 20 through Saturday, February 23, 2019. Metro’s contractor, RailWorks, will replace concrete railroad crossings and temporarily close intersections along the Blue Line. Metro’s contractor, RailWorks, will replace concrete railroad crossings and temporarily close the intersections along the Blue Line at 1st Street and Pine Av; and 10th Street and Long Beach Bl. Area: Willowbrook Av, between Compton Bl and Myrrh St.
Metro’s contractor, Railworks, will replace concrete grade crossings along the Blue Line beginning at 4th Street and Pacific Av on Monday, Jan 28th at 7 pm until Tuesday, February 12th, 2019 at 5 am. Area: Inside of the Metro-right-of-way at various Blue Line stations. Saw cutting of tracks inside of the Metro-right-of-way at various Blue Line stations. Closure of one northbound lane of Pacific Av (adjacent to the Railroad track), between 3rd and 4th St, for K-rail installation. Sign up to receive project email alerts.